For those not in the know, ‘nduja is a spreadable spicy pork sausage from Calabria (the very tip of the toe of the kicking foot of Italy). 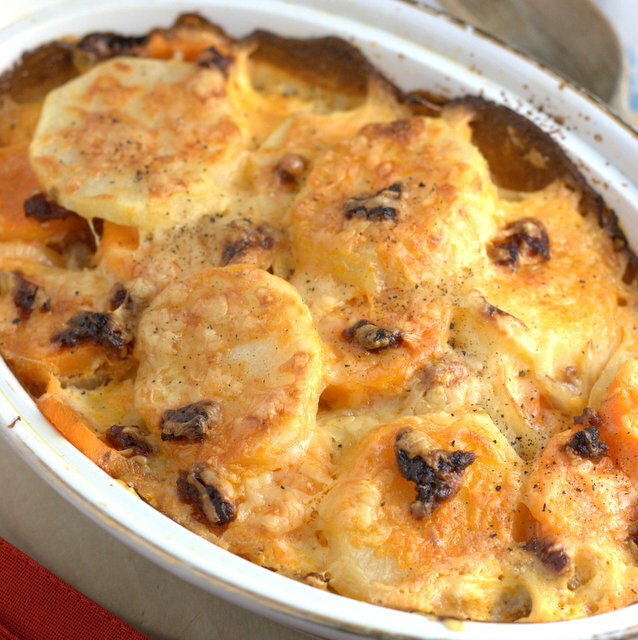 We’ve been using it on pizzas, with pasta, in a beany dip and in this gratin. My ‘nduja gratin was inspired by the Swedish dish of Jansson’s temptation, a gratin of potatoes, onions, sprats (usually mistranslated to anchovies in English) and cream. Like in the Jansson’s temptation where a small amount of anchovies go a long way and flavours the whole dish, so does the ‘nduja; making this both frugal and delicious. Maybe I should call this Giuseppe’s Temptation? Some recipes call for heating the milk and cream before pouring over the potatoes, I skip this and save on the washing up, just cook it for another few minutes. If you try this Recipe: ‘Nduja Gratin please tag #FussFreeFlavours on Instagram or Twitter. It is amazing for me when for me when you make one of my recipes and I really do love to see them. You can also share it on my Facebook page. Please pin this recipe to Pinterest too! Thanks for reading Fuss Free Flavours! 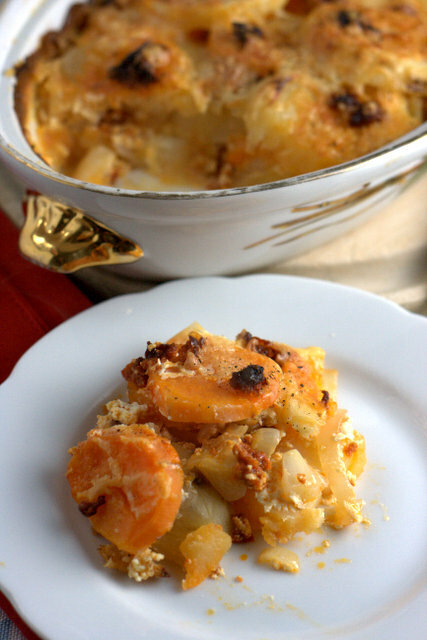 An easy to make variation on gratin potatoes for a side dish with added interest. Heat oven to 190c / 375F / GM 5. Boil the potatoes for 3 mins to soften a little, then drain. Meanwhile fry the onion in the butter and the olive oil for about 5 minutes until softened. Oil a gratin dish and layer the potatoes and onion adding little dots of the ‘nduja, seasoning each layer with a little salt and pepper, pour the cream and milk over. Top with more ‘nudja and the grated cheese. 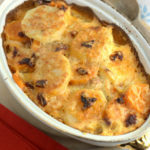 Bake for about 40 mins, until a the potatoes are soft and the top is golden.